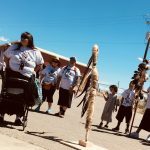 On May 19, 2018 about 100 White Mesa Ute Community members and supporters held a spiritual walk and protest of the Energy Fuels’ Uranium Mill. 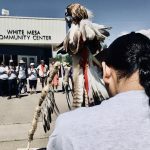 White Mesa Ute Community members and the Ute Mountain Ute Tribe are fighting to protect their health, water, air, land, culture, and sacred sites from the nearby uranium mill, the last operating mill in the nation which was built literally on top of and next to hundreds of ancient culturally significant and sacred sites. 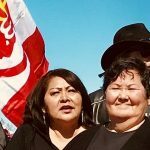 The facility emits radioactive and toxic contaminants into the air, land and groundwater and tribal members, allies and supporters are working to oppose the planned “alternative feed” shipments of radioactive and toxic materials that would continue to pollute their air, land and groundwater. 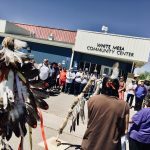 At the end of the walk, the crowd gathered around the Energy Fuels sign, Ute songs were sung and the sound of the drums celebrated the successful event as participants vowed to organize more actions against the mill. 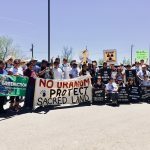 Greenaction stands in solidarity with the White Mesa Utes and the Ute Mountain Ute Tribe in this struggle to protect the peoples’ health, environment and sacred sites from the uranium mill’s operations. The government’s continued rubber stamping of permits for this polluter is a violation of human rights, and is racism pure and simple. The struggle for justice continues! 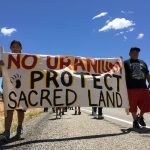 White Mesa Ute Community members and the Ute Mountain Ute Tribe are fighting to protect their health, water, air, land, culture, and sacred sites from the nearby uranium mill, the last operating mill in the nation which was built literally on top of and next to hundreds of ancient culturally significant and sacred sites. 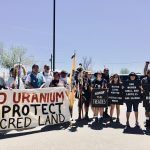 On May 19, 2018 about 100 White Mesa Ute Community members and supporters held a spiritual walk and protest of the Energy Fuels’ Uranium Mill. 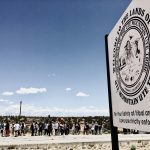 The facility emits radioactive and toxic contaminants into the air, land and groundwater and tribal members, allies and supporters are working to oppose the planned “alternative feed” shipments of radioactive and toxic materials that would continue to pollute their air, land and groundwater. 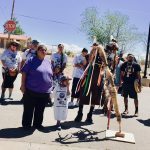 At the end of the walk, the crowd gathered around the Energy Fuels sign, Ute songs were sung and the sound of the drums celebrated the successful event as participants vowed to organize more actions against the mill. 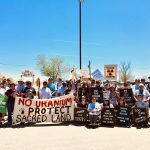 Greenaction stands in solidarity with the White Mesa Utes and the Ute Mountain Ute Tribe in this struggle to protect the peoples’ health, environment and sacred sites from the uranium mill’s operations. The government’s continued rubber stamping of permits for this polluter is a violation of human rights, and is racism pure and simple. The struggle for justice continues!